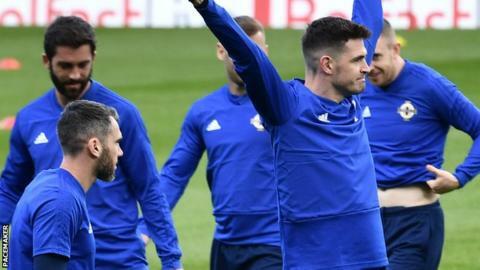 Northern Ireland manager Michael O'Neill is hoping his strikers' early season form can fire them to victory in Saturday's Nations League opener. Will Grigg, Kyle Lafferty and Liam Boyce have 11 goals between them going into the Bosnia and Herzegovina clash. Josh Magennis has also scored three, but O'Neill revealed on Friday that he is likely to miss the game with a groin injury. "It's nice to see them all scoring, it's a real positive" O'Neill said. "It may be a little bit early in the season, but it's still good. "It's great to see Will and Josh stepping up to the Championship and scoring three, while Laff [Kyle Lafferty] had a great debut for Rangers. "We need competition for places, whether it's in the striking positions, midfield or in defence. "That's what generates positivity within the squad and raises the bar in terms of individual standards for players. "I think the squad is in a good place. There are one or two who could do with having more game time at the club, but other than that we are in decent shape." Among those short of game time ahead of the match at the National Stadium are senior players Steve Davis and Jonny Evans. Captain Davis has made just one appearance for Southampton - in the League Cup - and defender Evans has only played twice since moving to Leicester City in the summer. "It is a concern as you want to see your players playing all the time," O'Neill continued. "Jonny got a little bit of an injury in pre-season which I think has been a factor in him not starting as many games at the start of the season. "For Steven it's new territory as he has always been an automatic choice at every club he's been at. "But they are experienced players who can deal with that and have the experience to come in and play in these games. "Certainly the way they have trained this week doesn't give me any serious concerns. I want to see them happy and playing at their clubs, of course, but that's out of my control." In terms of the major threats posed by Bosnia and Herzegovina, O'Neill is well aware that his defence will have to keep a close watch on Roma striker Edin Dzeko. O'Neill is familiar with visiting manager Robert Prosinecki's style of play and is expecting a difficult game. "They have plenty of pace in the wide areas and good movement in midfield," he added. "They are a relatively new team, Robert Prosinecki has come in and we know he will want to play that fluent style of football. "And, of course, they have Dzeko up front who has a phenomenal record with over 50 international goals."